What is the difference between UL Recognized and UL Listed Transformers? Sentran Corporation customers regularly request quotes for standard and custom 5A ratio type current transformers but only ask for the window size and the input current with no knowledge of the “burden”. The burden is specified as VA or resistance (or impedance), we can not guarantee the accuracy without the burden. The burden is the termination impedance of the measuring instrument, which can be an analog or digital energy meter, a data logger or a recorder. All instruments that use current transformers to measure line current must terminate the CT with a resistance (impedance in same case which means there is some inductance involved). The International Electrotechnical Commission (IEC) defines categories for rating the safety of electrical testing instruments. The higher the category (CAT), the closer the equipment being tested can be to the utility power source. A meter can have multiple category ratings. Measurement Categories are also used to rate test instruments on their ability to resist a voltage spike, which is applied through a specific resistance. The higher the category, the more risk there is that a high voltage can overload a circuit and cause electrical and physical damage. Electrical test & measurement tools are assigned to 4 different designations; CAT I, CAT II, CAT III, and CAT IV. Tools that interact with electricity are designed for specific applications and conditions. Exceeding or deviating from application parameter can lead to inaccurate measurements or injury. For Sentran Products, we will only be dealing with Categories III and IV. Learning about corrosion’s effect on Current Transformers (CTs) and knowing which CTs are built to endure corrosive environments can save you time and money in the long run. Sentran has a line of corrosion proof CTs engineered for use in outdoor and submerged environments. 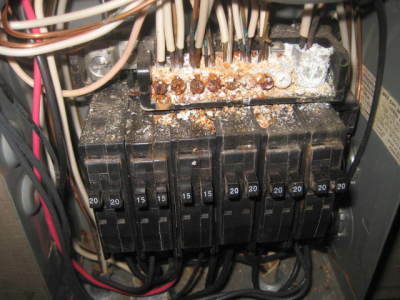 The impact of a corroded CT is more than just an unsightly component in an electrical panel. CTs are precision instruments that rely on the precise transfer of magnetic fields to accurately reflect the current flowing in a conductor. Corrosion interferes with the purity of this magnetic field transfer. CTs perform best when they’re made with the right materials that fit together properly. Corrosion changes both the materials and the fit. 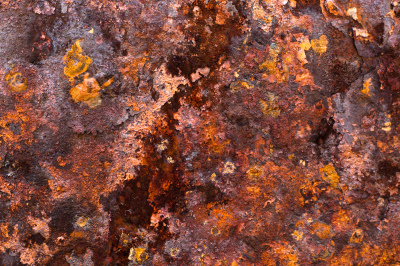 Corrosion is typically caused by oxidation, which changes the composition of the material at the molecular level. When iron is alloyed with carbon, a basic carbon-steel is created. Other elements are added to form a wide variety of proprietary steels. One unpopular alloy is oxygen. When oxygen is alloyed with iron, it forms iron-oxide, commonly known as “rust”. A clean, dry environment, such as an electrical cabinet, doesn’t usually support the conditions needed for these two elements to alloy. A chemical reaction is necessary. Water is often the catalyst needed to make the two combine. When steel corrodes, the affected metal expands chaotically as added oxygen molecules leave pockets of space in the steel material. These pockets allow more water to be trapped, creating a non-virtuous circle of increasing corrosion. When this happens the proprietary mix of metals is compromised, leaving less capable core material. Junctions and metallic joints are particularly susceptible to corrosion since any water that gets in is protected from the sunlight and wind that would otherwise dry it out. If unwanted air gaps or spaces, even very small spaces, are created in the core material of a CT it will have a negative effect on performance. Whether corrosion is in the core’s linear structure or its junctions, it will adversely affect magnetic properties. There are a variety of methods used to keep corrosion from finding its way into the core material and components of a CT. These include protective coatings, intrusion resistant designs and the use of potting to fill any voids that would allow moisture intrusion. All of these precautions are employed when Sentran builds weatherproof CTs, but none are going to prevent the corrosion of exposed metal surfaces. Surfaces of a split core CT are designed to have exposed metal. Preventing corrosion on these exposed surfaces is typically a function of the metal composition, not coatings or fillings. The core material used for Sentran’s all-weather CTs is a predominantly nickel alloy that does not corrode when it’s exposed to moisture. Even though these CTs are more expensive, they are often seen as a good value considering the costs associated with early CT failures or losing revenue due to a bad sensor. Current transformers, or “CTs”, use electromagnetic induction to sense alternating current (AC-Current) flowing through a wire. The CT provides an output that’s proportionally linear to the current it’s monitoring. Unlike power transformers, CTs use a very small amount of the “power” transmitted by the source. This enables the current to be safely monitored remotely. The output from the CT is sent to a metering device where the signal is electronically interpreted for power control or monitoring purposes. When using current as an output, the CT puts out only a fraction of the current it’s sensing. Even so, the output signal of older CTs can be dangerous. Do not disconnect or touch the terminal ends of a CT when it’s sensing a live current, particularly if it was not made to meet modern standards. the years call for an input (output signal from the CT) of either 5-amps or 1-amp to represent the full-load-amperage. When the 1-amp or 5-amp option is offered, the best accuracy is available from the 1-amp setting. A Current Transducer differs from a current transformer in that the output is not a direct representation of the source. A current transformer has a current input and an analogous current output. A current transducer has a current input and an output that has been modified to a different signal type. You will often see current-to-voltage transducers referred to as current transformers. They are, however, technically a transducer. Many of the newer model meters call for an AC voltage rather than amperage. This voltage is developed using a resistance built into the transducer. The most common AC voltage that a meter calls for is 333-millivolts. These are often preferred because of their ability to transfer the signal over longer distances with no loss of accuracy. The sensed current is converted from AC to DC, and then sent to a metering device. Most models that employ a DC voltage or a milliamp output are self-powered. Some common industrial applications call for a 4 to 20 milliamp output. These typically require an external power source. When using an amperage-output from a CT, the burden (VA) has to be known to ensure the output of the CT is accurate. Longer wires add resistance and can change the burden on the CT. Theoretically, distance has no impact on voltage, and therefore accuracy is inherently better in a transducer. Safety is another benefit of the meters that use a voltage input. Voltage is generally very low and amperage is limited by the circuitry used to develop the voltage. The output from this type CT (current transducer) is not dangerous, although safe practices should always be used. This is to certify that these units were manufactured in accordance with the instructions and also with terms of contract. No returns will be accepted unless return authorization number has been issued by Seller, Sentran Corporation (refer to our warranty policy). Material received without authorization number will be returned to customer at his expense. 1. TERMS OF AGREEMENT. Only the specifications for the product(s) ordered by the Buyer apply and is subject to change by Seller without notice. The application of the product(s) ordered is strictly the responsibility of the Buyer. Some products manufactured by Seller are either UL Recognized or UL Listed. Seller is not responsible for incorrect application of UL Recognized components interconnected to UL Listed instrumentation supplied by others or by the Buyer. This, together with the following terms and conditions, constitute the entire Agreement between Seller and Buyer. The terms and provisions of this acknowledgement shall be controlling. Any objections to any terms herein, including provisions which are in addition to or different from those contained in Buyer’s forms, must be in writing and shall not be deemed timely unless received by Seller within seven (7) days from the date of mailing of this Agreement. If Buyer makes timely objection to any term herein, Seller shall have the right to withdraw its acceptance and this acknowledgement. Buyer’s failure to object as specified will be deemed conclusive acceptance of all the terms and conditions of this acknowledgment. No acceptance by the Seller of any order shall be deemed to be an acceptance of any provision of the Buyer’s purchase order form. No purchase order will be accepted unless signed by an officer of Buyer organization and shall include all selling prices and any other handling and shipping fees including these terms and conditions. No other written or oral modification of the purchase order will be accepted. Modifications or changes to purchase orders submitted by the Buyer shall be a revision form of the original and signed by an authorized officer of the Buyer organization. The invalidity of any provision of this Agreement will not affect the validity of any other provision. 2. PRICES AND TERMS. Price, terms and availability of merchandise are subject to change without notice, including but not limited to changes caused by the fluctuations in market price, availability or quality of magnetic metals, magnet wire, lead wire and plastic resin or molded parts employed in the manufacture of the goods described herein. Unless otherwise provided on the face hereof, payment hereunder shall be due net thirty (30) days from the date of shipment. All amounts past due shall bear interest at the rate of 1.5% per month or at the maximum rate allowable by Oregon law. Seller’s obligation to produce or deliver hereunder is conditioned upon continued good credit of Buyer and upon Buyer’s payment when due of any sum owing by Buyer to Seller under any agreement between the parties. Based on Seller’s reasonable judgment, if Buyer’s financial condition at the time the merchandise is ready for shipment does not justify the terms specified, the Seller reserves the right to cancel credit provided to the Buyer, change these terms, to require full or partial payment in advance, or to ship the goods C.O.D. 3. SHIPMENTS. Shipment dates are based upon seller’s best judgment and are subject to factory schedules and production limitations, and hence are not guaranteed. 4. DELIVERY IN INSTALLMENTS. Seller reserves the right to make delivery in installments, unless otherwise expressly stipulated herein. All such installments shall be separately invoiced and paid for when due, without regard to subsequent deliveries. Delay in delivery of any installment shall not relieve Buyer of its obligation to accept remaining deliveries. 5. DELAY. Seller shall not be liable for delays in performance caused by act of God, fire or other casualty, accident, strike, shortage of labor or materials, governmental action or other cause beyond Seller’s reasonable control; and the time for Seller’s performance shall be extended by the period of any such delay. Seller reserves the right to apportion its production among its customers as it may determine. 6. LIMITED WARRANTY. Except as provided herein, seller expressly excludes all warranties, expressed or implied, including warranties of merchantability and fitness for a particular purpose. Seller warrants to buyer that all of its products shall be free from defects in material and workmanship during normal use and service. No agent, employee or representative of the Seller has any authority to bind Seller to any affirmation, representation of warranty concerning the goods sold under this Agreement, and unless an affirmation, representation or warranty made by an agent, employee or representative is specifically included within this Agreement, it is not deemed a part of the basis of this bargain and shall not in any way be enforceable. 7. INSPECTION. Prior to shipment. Buyer shall have the right and shall be given the opportunity to inspect the goods at the Seller’s place of manufacture. Such inspection shall be so conducted, as not to interfere unreasonably with the Seller’s operations, and consequent approval or rejection shall be made before shipment of the material. Notwithstanding the foregoing, if upon receipt of such material by Buyer, the same shall appear not to conform to the contract between Buyer and Seller, Buyer shall notify Seller, in writing, within fifteen (15) days from date of shipment of the goods of such condition. Failure to give notice within the time specified shall constitute an irrevocable acceptance of the goods. No claims, of any kind, by Buyer shall be valid without notice, as specified. Buyer shall afford Seller a reasonable opportunity to inspect the material and repair or replace any materials determined by Seller to be nonconforming, No material shall be returned without Seller’s consent. 8. REMEDY FOR NONCONFORMING GOODS. If the material furnished to Buyer shall fail to conform to the contract, or to any expressed or implied warranty as stated herein, Seller, at his discretion, shall, within thirty (30) days of notice of said non- conformity, issue credit for or shall replace such non-conforming material at the original point of delivery and shall furnish instructions for the disposition of the nonconforming material. Any transportation charges involved in such disposition shall be for Seller’s account. Buyer’s exclusive and sole remedy on account of or in respect to the furnishing of material that does not conform to this contract, or so any expressed or implied warranty, shall be to secure credit or replacement thereof as aforesaid. Seller shall not, in any event, be liable for the cost of any labor expended on any such material or for any special, direct, indirect, incidental or consequential damages to anyone by reason of the fact that such material does not conform to this contract, or to any expressed or implied warranty herein. No claim of any kind will be considered on materials, which have been converted, changed, processed or used in manufacture. 9. SPECIFICATION CHANGES. Specification changes are subject to acceptance by Seller, including price revisions and any adjustments necessary to cover material procured and processed and labor expended prior to receipt by Seller of revised specifications. 10. BUY AMERICAN ACT ARRA-2005. The Seller represents that all items are designed and assembled here in Oregon using local labor. Only some raw material, not available within the United States, such as sheet magnetic metals and bulk plastic resin, is manufactured outside. 11. GOVERNING LAW. All contracts between Buyer and Seller shall be governed by and construed in accordance with the applicable laws of the State of Oregon. 12. NON-WAIVER. Waiver by Seller of the breach of any of the terms and conditions of this contract shall not be construed as a waiver of any other breach. 13. RISK OF LOSS. Identification of the goods sold herein occurs at such time as Seller places said goods in the hands of the carrier for delivery as herein provided for. Upon identification, risk of loss passes to Buyer. Title remains with Seller until Seller receives payment for said goods. 14. INDEMNIFICATION. Buyer will indemnify and hold Seller harmless from, and defend Seller against, any loss, suit, claim or damage to persons or property arising out of this Agreement or Buyer’s possession or use of the products provided, or any purchaser’s possession or use of the products provided, which indemnity will survive the termination of this Agreement, provided that such loss, claim or damage was not caused solely by the fault of the Seller. 15. CANCELLATION. Any request for cancellation must be presented to Sentran Corporation in writing. Sentran Corporation may accept cancellation of an order for standard parts prior to standard lead time. Within standard lead time, cancellation may be refused or subject to a cancellation charge. Request for cancellation of any non-standard parts are subject to cancellation charges up to 100%. Blanket order cancellation will be based on the original ship schedule, not on subsequent delivery re-schedules. 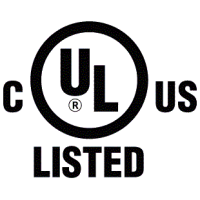 UL Recognized and UL Listed certification are NOT the same. 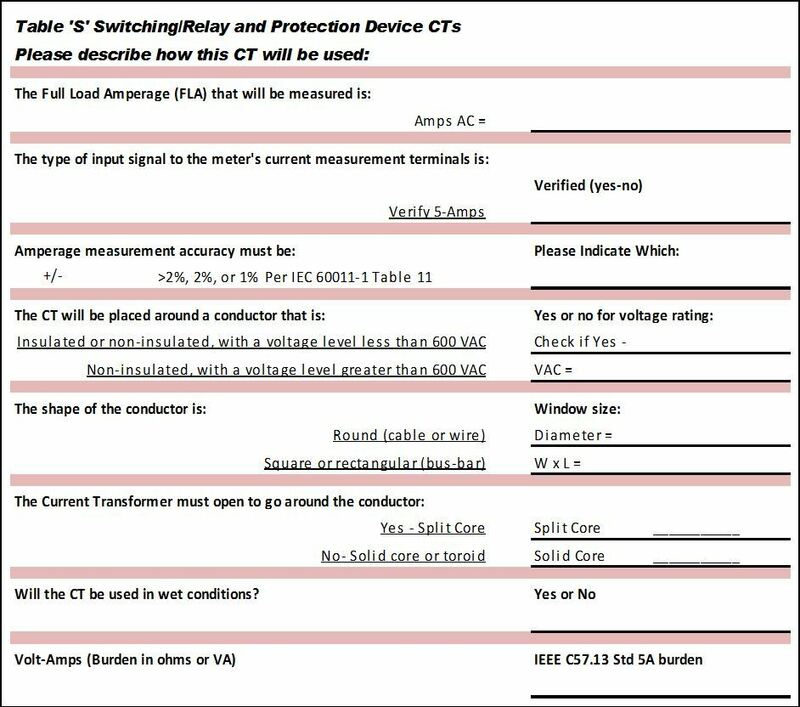 Take the time to read the attached PDF to fully understand the difference before buying and attempting to install current transformers in the field. We’ve had customers who had to remove them from installations because of the wrong certification. 2. TO REDUCE THE RISK OF ELECTRIC SHOCK, ALWAYS DISCONNECT CIRCUIT FROM POWER DISTRIBUTION SYSTEM BEFORE INSTALLING OR SERVICING CURRENT TRANSFORMERS. 3. DO NOT INSTALL IN AN AREA BLOCKING VENTILATION. DO NOT INSTALL IN AN AREA OFBREAKER ARC VENTING. 4. NOT SUITABLE FOR CLASS 2 WIRING METHODS OR CONNECTIONS TO CLASS 2 EQUIPMENT (CLASS 2 WIRING IS 300V RATED OR LESS THAT IS USED ON SPEAKERS, DOOR BELLS, ETC). 5. DO NOT ALLOW CURRENT TRANSFORMER OR ROUTE CONDUCTORS TO COME IN DIRECT CONTACT WITH LIVE TERMINALS OR BUS THAT EXCEEDS 600VAC . AMBIENT TEMERATURE-40C TO +55C. ELEVATION MAXIMUM 2000 METERS. 1. Locate and turn off power to distribution panel. 2. Remove screws, remove or tilt the removable leg of the CT.
4. Repeat for all current transformers to be installed. 6. Apply power to panel then proceed with system setup/testing. 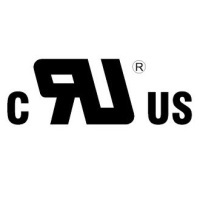 We know the responsibility of ordering CTs often defaults to the purchasing agent. 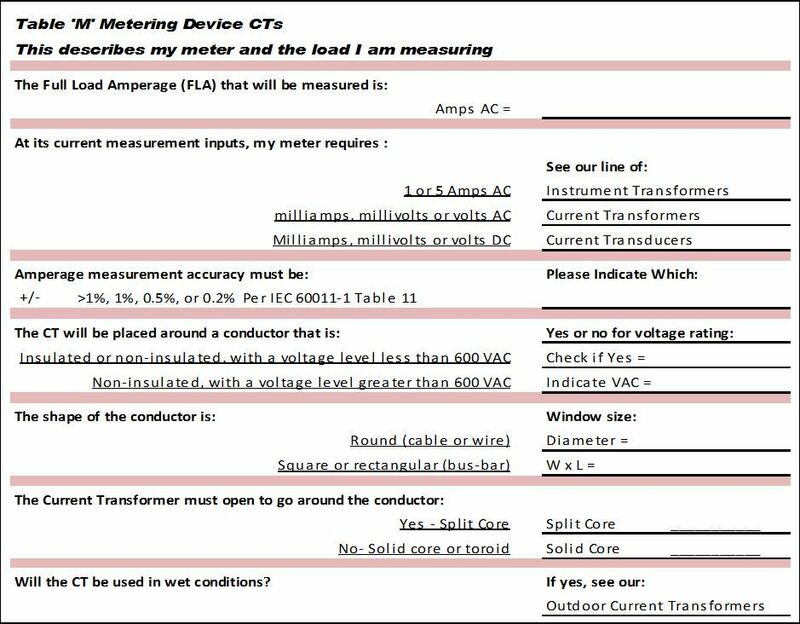 This guide is designed to help non-engineers, as well as engineers choose the right CT. “Current Transformer: or CT broadly refers to the group of current transformers, current sensors, and current transducers. The industry has accepted this consolidation of terms primarily because they all allow you to measure current. 1. If you selected “Instrument Transformers”, we will need to know the burden. The definition of “burden” is on our web site in the technical information section, under the title, What does “CT burden” mean? 2. If not stated as a specific standard, (i.e., “per IEC 60011-1 Table 11”), the accuracy specifications are likely indicated only at Full Load Amperage (FLA). Due diligence is recommended when selecting the accuracy classification your CTs need to meet. 3. When discussing accuracy, the term “Revenue Grade” is used to describe the concept of measurement for financial comprehension purposes. It is often associated with an accuracy of 0.5% or better per IEC 60011-1 Table 11, but is not specifically defined as such. 4. High voltage CTs are available in many models. We have received ETL certification on models up to 4160 volts. Higher voltage models are available but have not been submitted for certification. 5. Solid core CTs can be provided in most of our housings. Solid core CTs, particularly toroids, are less prone to interference from nearby power sources. CTs used for switching-relays and protection devices generally have 5-amp outputs. Although accuracy is important, it is less important than its ability to perform well during over-current conditions. 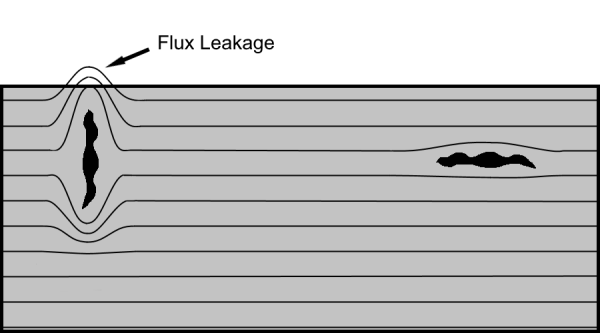 This type CT must be able to provide current well above its Full Load Amperage (FLA) rating and has an IEEE classification rating to indicate its designed capability. Sentran Corporation has been called upon to proved this type CT for unusual applications, including off-shore platforms and split-core requirements. These custom designs may require additional lead time. Each and every CT manufactured by Sentran Corporation is tested at various stages of completion, with a final test and inspection conducted prior to sale. A serialized certificate of compliance is provided with each order that lists every CT and its results. All Sentran CTs come with a 5-year warranty.